"Psych" is a quick-witted comedy/drama starring James Roday as young police consultant Shawn Spencer who solves crimes with powers of observation so acute that Santa Barbara PD detectives think he's psychic. Psych also stars Dule Hill as Shawn's best friend and reluctant sidekick, Gus, and Corbin Bernsen as his disapproving father, Henry, who ironically was the one who honed his son's "observation" skills as a child. Also featured are Timothy Omundson, Maggie Lawson and Kirsten Nelson. 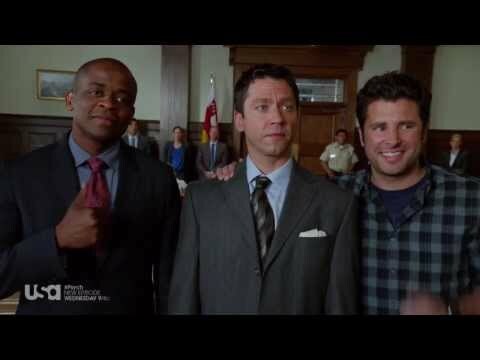 Psych continues USA's tradition of original scripted programming centering on quirky, intelligent characters. As with Monk, Psych mixes comedy with its crime and features a somewhat eccentric lead character - Shawn, a police Psychic with absolutely no psychic abilities. Raised in Santa Barbara by a family of cops, Shawn possesses uncanny powers of observation honed by his police officer father, Henry, who drilled young Shawn to note even the smallest of details from his surroundings as a way of grooming him for his inevitable career in the family business. Unfortunately, when a rift develops between father and son, Shawn finds himself taking a series of random jobs instead of becoming the detective he was groomed to be. However, for the fun of it, Shawn makes a habit of calling in tips to the police about cases he reads about or sees on television, and when one of his tips appears too close to the truth, the police are convinced that Shawn is an accomplice and arrest him. Using his charm and well-tuned talent, Shawn convinces the cops that he's actually a psychic, and although highly skeptical of his explanation, they hire him to help solve tough cases. With the reluctant assistance of his best friend Gus, Shawn uses his skills of observation and charismatic personality to become the detective he was trained to be, opening his own PI agency - Psych - and solving cases for an ever-suspicious, but grudgingly impressed, police force.